Peel, core, and roughly chop apples. 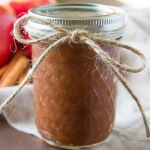 In a slow cooker, add apples, apple cider, brown sugar, pumpkin pie spice, and salt. Cover and cook on low for 8 hours. Stir and let sit uncovered on low for an additional 2 hours. Use an immersion blender to blend until smooth consistency. Let cool and transfer to mason jars for storing/gifting!